EVCleaner size exclusion columns ensure efficent separation of extracellular vesicules from unwanted size components in sample. EVCleaner has been designed to collect enriched extracellular vesicles(EVs) from samples. The EVCleaner size exclusion column has been especially designed to enrich samples in extracellular vesicles. 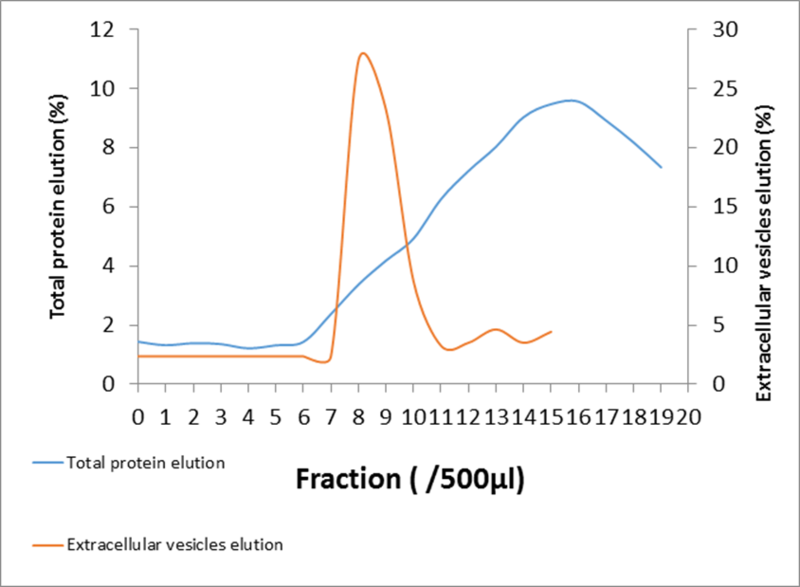 Thanks to a careful optimization, over 95% of soluble proteins in the sample can be discarded through the elution while a gentle recovery of all the exosomes is obtained. Representation of elution model. Elution changment may occur for different experimental models. Performed on HeLa cell culture meidium. Diagenode strongly recommends using this:	EVCleaner (Diagenode Cat# C28020001-1). Click here to copy to clipboard.